Simple and elegant, the Zodiac Constellation Necklace is the perfect gift for any woman in your life—or for you. Beautifully handmade in Maryland, each pendant is handstamped with the individual constellation. 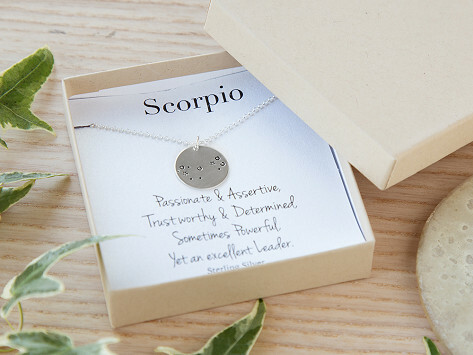 The necklace is packaged in a gift box decorated with the unique characteristics of each zodiac sign, ready for gift giving. Dimensions (in packaging): 4" x 4" x 1"
She liked it, that's all that mattered. Jewelry you can wear every day doesn’t need to be . . . everyday. 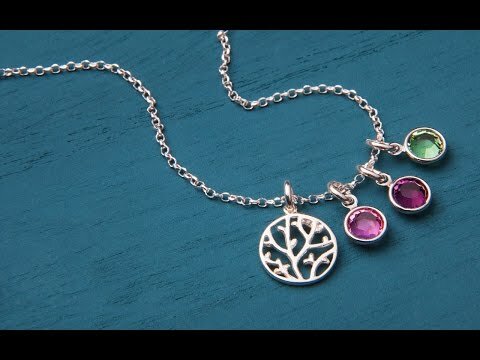 Each elegant, handmade family tree necklace from Vintage Stamp Jewels takes on a personalized meaning for the woman who wears it. The delicate family tree charm represents the life connections that matter to each of us. Then, you choose the color and number of Swarovski crystal charms that accompany the tree. The bezel-set crystals can represent any important moments and people—birthstones for children or grandchildren, milestones, anniversaries, or any special date. You can even specify the order that the crystals are placed in. Maker Monica Sisk started making jewelry while at home with her young children, with the goal of creating unique and thoughtful pieces. She quickly attracted a following for her customized, classic designs. Each is handmade in Maryland and makes a meaningful gift. Monica even packages each necklace in a present-ready box. These personalized conversation pieces give any woman a reason to talk about the meaning behind the charms—or simply keep them close to her heart. These individualized necklaces are each as unique as the women who wear them.